I love having a nosey at other people's 'empties posts' and I seem to have used up a few products recently so I thought I'd do an empties post so I can share my opinions on the products and most importantly if I would repurchase them. Garnier Ultimate Blends Shampoo 'The Sleek Restorer' - I'm sure I've mentioned countless times on my blog that I love the shampoos and conditioners from this range (the Dry Shampoo not so much). This shampoo does exactly what it says on the bottle - it leaves my hair looking much less frizzy and much more sleek, whilst still giving my hair a good cleanse. Oh and it smells amazing too. I have already repurchased this shampoo and I'm sure that I'll continue to do so. 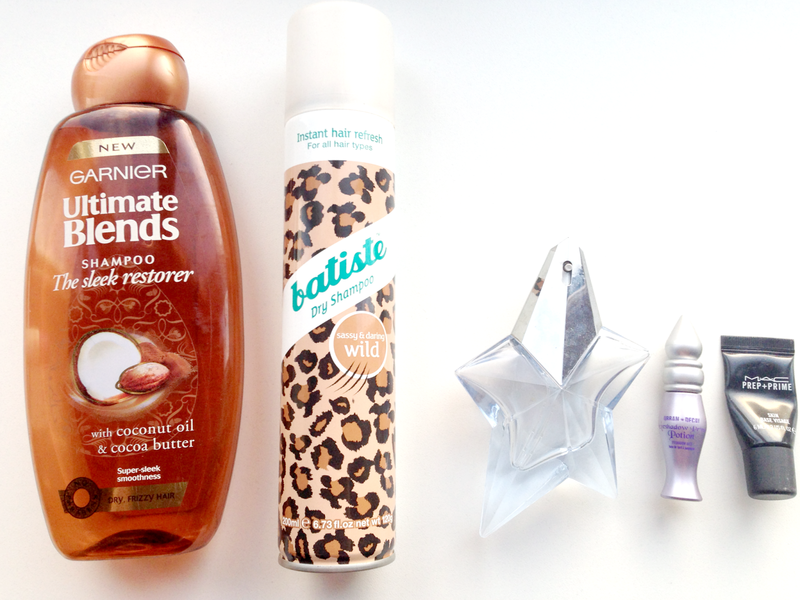 Batiste Dry Shampoo 'Wild' - I've had a love/hate relationship with Batiste ever since I started using it a few years ago. Whilst this dry shampoo does leave my hair feeling cleaner and is a lifesaver on those mornings where my hair isn't looking it's best, my roots are left with the dreaded grey/white chalky look (despite spritzing the product at a distance and brushing it through). Even though this product does smell lovely the grey/white chalkiness has really put me off so I won't be repurchasing, especially since I discovered the COLAB Dry Shampoos (full review here). Thierry Mugler Angel EDP - This fragrance really splits opinions - some of us love it whilst others hate it. If I had to choose I'd say that it's my favourite fragrance, it smells amazing and it's very long lasting once applied to the skin. I have already repurchased this perfume. Urban Decay Primer Potion (Sample) - I received this sample with my Urban Decay Naked Palette and it is the perfect base to use alongside those eyeshadows (or any other eyeshadows for that matter). I have to admit that I don't always remember to use the primer before I apply my eyeshadow but when I do there is a noticeable difference to the wear time. Whilst I do love this product I think it's pretty expensive for something I wouldn't always remember to use, so I'd like to try to find a cheaper alternative (please let me know if you know of any good dupes). MAC Prep + Prime Skin (Sample) - At some point last year MAC were giving away samples of Prep + Prime Skin on their Facebook page and I managed to get hold of one of them. When I used the product it created a good base and allowed my foundation to be applied much more smoothly,however I don't think that it really extended the wear of my foundation - as this is one of the main things I look for in a primer I won't be repurchasing. What products have you used up recently? Would you repurchase them? All content by natashaparisblog unless stated otherwise. Powered by Blogger.